Charles Loesch-Quintin ’13 has won six straight matches. Despite losing its first four January matches, the men’s squash team managed to win its final four in impressive fashion. The Jeffs began interterm action by dropping back-to-back contests to second-ranked Yale and 19th-ranked Bates, and their slide continued the following week against two more tough opponents, No. 14 Middlebury and No. 13 Brown. From there, however, the Jeffs rallied as they hosted the weekend-long Pioneer Valley Invitational. They began with a 6-3 takedown of Hamilton behind sweeps from David Kerr ’14 (#1), Charles Loesch-Quintin ’13 (#5), Todd Lavine ’12 (#6) and Alex Southmayd ’15 (#8). On Saturday, the Jeffs went two-for-two, shutting out Hobart and nearly repeating the feat against Conn. College, whom they ultimately beat 8-1. In Sunday morning’s tournament finale, the squad posted arguably its biggest win of 2011-12, downing No. 20 Colby by a score of 5-4. Scott DeSantis ’15 (#3) and Lavine both won handily, staking their team to an early 2-0 lead. Amherst’s next three players did not fare as well, however, and the Jeffs found themselves in a sudden 3-2 hole. Rising to the occasion, Southmayd came from behind to beat the Mules’ Ben York, 3-1, and Loesch-Quentin delivered the match of the day, overcoming a 2-0 deficit to top Will Hochman, 3-2. With his team now leading, Max Kardon ’15 (#4) provided the knockout blow, earning a sweep and clinching an Amherst victory. The Jeffs look to ride their momentum into next weekend’s Little III Championships, where they will take on hometown No. 19 Wesleyan and No. 10 Williams. The Jeffs have not lost to Wesleyan during Coach Peter Robson’s 25-year tenure, but the No. 19 Cardinals enter the weekend ranked higher than No. 23 Amherst. The matchup will be an important test for the Jeffs as they hope to continue beating close-ranked opponents. 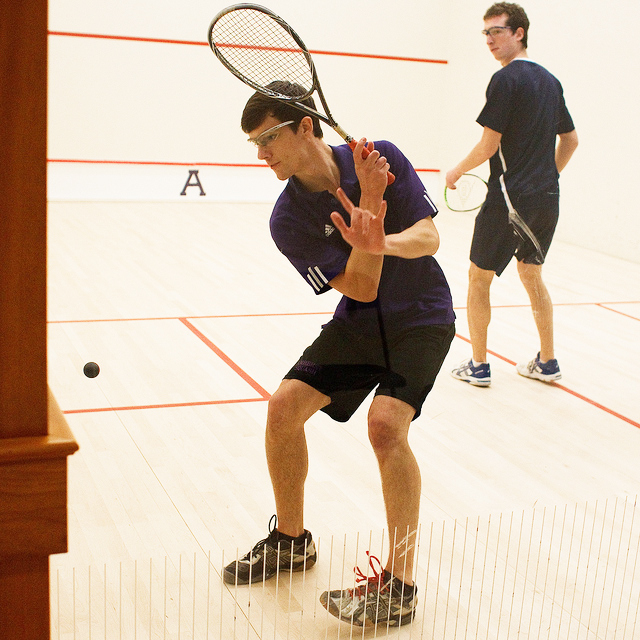 Like the men, the women’s squash team finished interterm play better than they began it. After setbacks against higher-ranked opponents Yale, Bates, Middlebury and Brown, the No. 15 Lady Jeffs dropped a disappointing 6-3 match to No. 18 Hamilton in their Pioneer Valley Invitational opener. Undeterred, the Amherst women bounced back with decisive wins in their last four contests of the tournament. They managed to shut out three straight opponents — Wellesley, Tufts and Conn. College — before closing out the weekend with an 8-1 victory over Colby. Five Jeffs did not relinquish a single point in those final four games, including Megan Clower ’12 (#9), Evelyn Kramer ’14 (#4) and Anna Scheidt ’12 (#5). Next weekend, the Lady Jeffs will also travel to Wesleyan to take on the Cardinals and the Ephs in the Little III Championships.